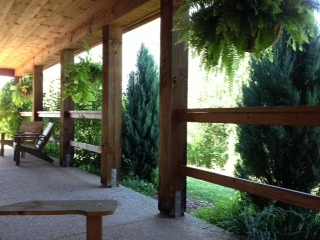 One of my writing spaces at the Inn at Cedar Falls. Imagine being given the gift of time to reflect, write, and connect with other writers who have become friends. I received that gift last week when I attended the Central Ohio Choice Literacy writing retreat hosted by editor, Brenda Power in the beautiful Hocking Hills. We had 2 1/2 glorious days of uninterrupted time to write, talk to other writers, hike, laugh, eat wonderful food, share our stories, and strengthen friendships. I arrived excited about the time to write and reconnect with friends. I left feeling refreshed, refocused, and determined to create new habits that included giving myself time every day to write. And as it always happens when I spend time with these fabulous people, I gained a bit more perspective about myself as well as my students. Our theme was Habits. I am a perfectionist. I want to start a job and finish it, and I want to get it done quickly and correctly the first time. That attitude doesn't lend itself to writing. As a result, ideas swirl around in my head, I jot down ideas, but I never get back to them because I know it's going to take more time than I have to write a complete piece, be it a blog post, an article for Choice Literacy, or something for school. 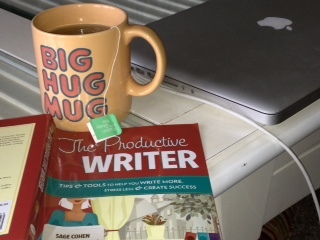 Sage Cohen says in The Productive Writer, "We all get the same twenty-four hours in a day. What you do with yours is up to you. You may believe that you have no time, but the fact is, you have as much time as anyone else." She tells the reader to pay attention to how she spends her time. Then, "Once you become conscious that your relationship with time is not something that happens to you but a dynamic orchestrated by you through dozens of large and small choices you make every day, you can evaluate if you would like to choose to continue the pattern you are in or create a new one." One of my writing spaces at home. I am all about creating some new patterns. I don't want to continue on this perfectionistic path. I want to create the habit of writing every day and give myself permission to not have a completed piece of writing at the end of each writing session. What habits are you trying to instill in your life? How can you make it happen? You captured the essence of our retreat beautifully, and I am right there with you realizing now small writings can make an amazing article. I shifted this morning and wrote first and then my reward was reading blogs. Thanks for sharing your reflection. My cues are ready for me bright and early in the morning. Thanks for sharing this beautiful blog post. You wrote a great article, I like your subject of this article. I am interested to write an article, but I cant make it perfect. I need to complete my essay perfectly in one month so I decided to take essay writing service help. Now I got an essay writing service reviews site, I am sure I will get a best website.